When toddlers are learning to feed themselves, they often get more ketchup on their clothes than on the French fries. In a "perfect" kitchen, we'd have a floor drain so that we could hose the kids down when they're finished eating. Lacking the "perfect" kitchen, this project will help keep the kids cleaner and there is even a pocket to catch the "big spills." These bibs are great for busy moms and make wonderful little gifts for showers, birthday, and other special events for toddlers. The samples shown are made with single-faced quilted flannel. The blue bib was embroidered using EnVision Card #7, Little Grey Rabbit, EnVision Card #112, Farm Designs, and personalized with the Alphabet Card #101. The sleeves and lining fabric was a purchased fabric with Beatrix Potter designs. 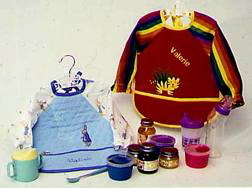 The red bib was appliquéd using a design from a purchased children's novelty fabric. The appliqué was fused to the front of the bib using Wonder Under and then stitched around with appliqué stitch #26 (2.0 width, 2.0 length), and personalized with the Alphabet Card #101. This is a two-step process that will give a very nice edge finish. Look carefully at the folds of the bias tape. You will notice that one fold is slightly smaller than the other. 2.Fold the bias tape over the edge to the right side of the bib and stitch close to the edge of the bias tape. Use a 1/4” seam allowance unless instructed otherwise. 1. Cut out one front, one front lining, one pocket, one pocket lining, and 2 sleeves. 2. Embellish the bib front in any manner you wish, machine embroidery or appliqué. 3. Machine baste the front lining to the bib front wrong sides together. Machine baste the pocket lining to the pocket wrong sides together. These pieces will now be treated as one. 5. Lay the pocket on the front of the bib with the bottom and side edges even. The wrong side of the pocket goes on the right side of the bib front. Machine baste along the sides and bottom approximately 1/8" from the raw edge. 7. On the wrong side of the sleeve, place a 7"-long piece of elastic 1" in from the finished wrist edge. Select the zigzag stitch and attach the elastic following elastic application instructions below and Illustration #3. Approximately 1" from one end, make a mark with your fabric marking pen. Measure the distance you need from that mark (in this case, 7”), and mark again. Leave a 2” gap and mark again. Measure and mark off 7” again for the second sleeve. Do not cut just yet! Lay the elastic on the fabric with the first mark even with the edge of the fabric. The first inch will hang off the edge. Straight stitch in the middle of the elastic for 1/2" and stop. Change your stitch to a wide zigzag, 6.0, and stitch across the elastic, stretching the elastic so that the second mark is even with the other edge of the sleeve. About 1/2" from the edge, switch back to a straight stitch and finish. The zigzag stitch makes a casing while the straight stitches keep the elastic in place. Cut the elastic in the center of the 2" gap and repeat for the second sleeve. When sewing the underarm seam, you can hang onto the over-the-edge elastic to keep your seam allowance even; trim off the excess when you are finished. 8. With right sides together, sew the sleeve fronts to the bib front. Press the seam toward the sleeve. Finish seam allowance with a zigzag stitch or a 3-thread overlock stitch. 9. Sew the underarm seam of each sleeve from the wrist edge to the dot. Finish seam allowance with a zigzag stitch or a 3-thread overlock stitch. 10. Turn the sleeves right side out.